If you are involved with Colfax-Mingo school activities or have had a family-related case at Jasper County Court, chances are you know Dusty Clements. Being a mom of four is a tough job on its own, but Clements, a Colfax, Iowa, resident, now dabbles in a bit of jurisprudence. Clements owns and operates a law firm in downtown Newton — Clements Law & Mediation, LLC. Clements said she likes having her family life in Colfax while keeping her career life in Newton keeping both worlds separate. 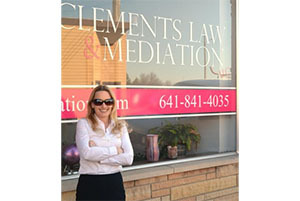 Clements provides services in criminal defense, real estate and estate planning and probate at her office located at 209 N. Second Ave. W. in Newton. She also provides family and juvenile law and mediation, is a member of the Iowa State Bar Association, Central Iowa Academy of Collaborative Professionals, Certified in Collaborative Law and is a Certified Family Law Mediator. In 2012, Clements graduated with a degree in criminal justice and public administration from Upper Iowa University. Afterward, she received her master’s degree in forensic psychology from the University of North Dakota. On her last stop, Clements enrolled at Drake University’s Law School, graduating with Honors in 2016. Clements, a Bondurant native who graduated from high school in 1999, originally began her studies at Des Moines Area Community College in 2008. She did so while raising her children and running an in-home daycare since she and her husband moved to Colfax in 2006. While it paid the bills, was fulfilling for a while and allowed her to be there for her kids, the threat of burnout from non-stop youngsters, being a mother and pursuing law school was taxing. “I did the daycare, the majority of it through school,” Clements said. “I’ve always liked working with kids, so this was kind of a different way to be able to help them. The daycare, called Teddy Bears and Tricycles, helped Clements pay her way through graduate school and enter law school in 2013. Clements was able to intern at the courthouse for a judge while still attending law school. Then, in 2016, she bought the space northwest of the square and opened the practice. When she bought her building in Newton, the two commercial spaces inside the floor-level part of the building were disorganized, and the two apartments upstairs were in horrible condition, Clements said. Her husband remodeled the entire building for her to perfection, while pink decorations went up everywhere to make her stand out; and it doesn’t hurt pink is Clement’s favorite color. “It took a whole year to do the whole thing,” Clements said. “My office was done when I started in September 2016. Now with two of her kids in high school and the other two in fifth and sixth grade, Clements endures through the tough challenge many professional parents live through. When she isn’t in the courtroom, Clements is involved with Colfax events such as the Dollars for Scholars dodge ball tournament. But the support she receives from her husband goes a long way, as well as knowing her kids are proud of her.